Ladysmith Black Mambazo, a Grammy award-winning singing troupe, brought its blend of vocal harmonies to downtown Merced as part of Arts UC Merced Presents spring event lineup. The group performed at 7:30 p.m. Thursday, March 6 at the Art Kamangar Center at the Merced Theatre. Ladysmith Black Mambazo’s career spans 50 years and their work has garnered critical and popular acclaim. Members perform joyous and uplifting music that marries the intricate rhythms and harmonies of their native South African musical traditions to the sounds and sentiments of Christian gospel music. UC Merced Professor Dunya Ramicova, also the artistic director of Arts UC Merced Presents, has included attendance of the Ladysmith Black Mambazo performance in the content of her course Theater and Social Responsibility. Ladysmith Black Mambazo exemplifies the role art plays in supporting the ideals of peace and equality, Ramicova said. The group started a nationwide tour in January in support of its latest album, “Always With Us,” which honors Nellie Shabalala, the group’s matriarch wife of founder and l Joseph Shabalala, by mixing the group’s vocals with tracks she recorded before her death in 2002. 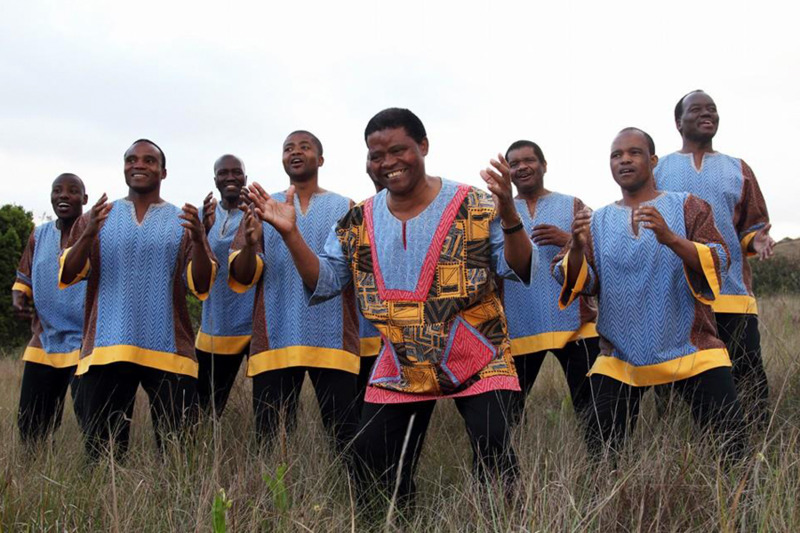 Mambazo’s previous album, “Live: Singing For Peace Around The World,” earned a Grammy last month. “This album comes from deep inside my heart. It might be more personal than anything we have shared with the world before," Joseph Shabalala said in a statement. Assembled in the early 1960s in South Africa by Joseph Shabalala, who was a young farmboy turned factory worker. The group took the name Ladysmith Black Mambazo. Ladysmith is the name of Shabalala’s rural hometown; Black is a reference to oxen, the strongest of all farm animals; and Mambazo is the Zulu word for axe, a symbol of the group’s ability to “chop down” any singing rival who might challenge them. Their collective voices were so tight and their harmonies so polished that they were eventually banned from competitions – although they were welcome to participate strictly as entertainers, according to the band’s biography. In the mid–1980s, Paul Simon visited South Africa and incorporated Black Mambazo’s rich tenor/alto/bass harmonies into his Graceland album — a landmark 1986 recording that was considered seminal in introducing world music to mainstream audiences. A year later, Simon produced Black Mambazo’s first U.S. release, Shaka Zulu, which won a Grammy Award in 1988. In addition to their work with Simon, Ladysmith Black Mambazo has recorded with numerous artists from around the world, including Stevie Wonder, Dolly Parton, Sarah McLachlan, Josh Groban, Emmylou Harris, Melissa Etheridge,and many others. Since then, the group has been awarded two more Grammy Awards and have been nominated more than a dozen times. "Renowned South African A Capella Group to Perform"
soundtrack of South Africa for decades." "At the heart of everything Ladysmith Black Mambazo does there is joy."